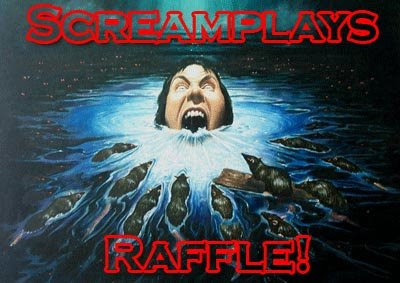 Fantasy Book Critic: “Screamplays” edited by Richard Chizmar & Martin H. Greenberg — Cover Art, Description & Raffle Info! “Screamplays” edited by Richard Chizmar & Martin H. Greenberg — Cover Art, Description & Raffle Info! Cemetery Dance Publications is pleased to announce a Special Collectible Hardcover Edition of the “Screamplays” anthology edited by Richard Chizmar and Martin H. Greenberg. 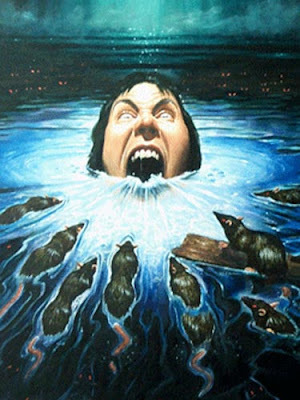 “Screamplays” features Stephen King, Richard Matheson, Dean Koontz, Richard Laymon, Harlan Ellison, Joe R. Lansdale and Ed Gorman, along with interior artwork by some of the top artists working in the genre today as well as a cover by the British Fantasy Award-winning Les Edwards. You don't need a movie theater or a DVD player to savor the best in cinematic terror and suspense. All you need is your own imagination and this collection of spine-tingling scripts by the titans of shock storytelling. Whether you're a movie buff or a thriller freak, you'll savor these seven full-length film and TV scenarios, including Stephen King's “General”, Richard Matheson's “The Legend of Hell House,” and Richard Laymon's “The Hunted”, plus chilling works by Harlan Ellison, Joe R. Lansdale, and Ed Gorman. Also includes a fascinating introduction on fright films by #1 bestselling author Dean Koontz. “Screamplays” will be available in two editions. A 1) Trade Hardcover Edition bound in cloth ($40) and a 2) Traycased Lettered Edition of 52 copies signed (by the editor and artists) and lettered hardcover copies bound in leather with a satin ribbon page marker and additional full-color artwork ($300). The two editions can be ordered HERE. Additionally, if you place an order for “Screamplays” by Friday, March 6, 2009 – 5:00PM EST, then you’ll be entered in Cemetery Dance’s unique “Everyone Wins Raffle”, in which everyone wins SOMETHING! ~A special Advanced Review Copy of The Secretary of Dreams (Volume Two) by Stephen King—published early as a trade paperback for reviews and booksellers, this is the rarest state of any book we publish and a special prize for the Stephen King collector since these are not available for sale! But everyone who enters will win a FREE GIFT. This gift, which is in addition to any of the prizes you could win, will be a THREE ISSUE trial subscription to Cemetery Dance magazine, starting with CD #60! That means you'll receive Bob Morrish's last issue, the Peter Straub Special Issue, and the William Peter Blatty special issue FOR FREE! If you already have a subscription, then Cemetery Dance will just add three more issues to it for free. This is an $18 retail value.